If there is something to see, put your pig on the wall for them to see it too! 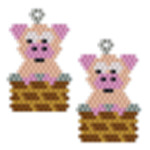 ..... Or wear a pair of pig on the wall earrings at least! This pattern is based on a local legend from Gornal, where the sight of a band parading through the village was such a sight to see, someone even "put a pig on the wall to watch the band go by" This Pig on the Wall bead pattern is made using Japanese Miyuki size 11 Delica beads and peyote or brick stitch can be used. It is assumed the beader will be familiar with either Brick, Peyote or Both. Peyote and Brick stitch bead instructions are available free on www.threadabead.com. Please note the pattern may not work with any other size and type of beads. There are 8 colours in total and the finished beadwork is approximately 2.362 cm x 3.105 cm. The bead pattern supplied is 5 pages and includes a colour chart of suggested delicas, a colour pattern and a numbered coloured pattern.